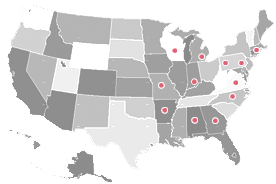 WaterOne serves residential and commercial customers in 16 cities in the Johnson County area of metropolitan Kansas City. Part of the treatment process involves the use of activated carbon that is stored in large concrete vaults. The activated carbon is treated with an acid solution which enhances the effect of the carbon but is corrosive to concrete. After many years of use the concrete storage vaults were noticeably corroded and eroded from chemicals and abrasion. WaterOne decided to restore and protect the concrete and asked for a recommendation. We recommended the use of PermaClean 100 for several reasons. First the product needed to be NSF approved. Additionally a very high build product was needed to cover and envelop the concrete and exposed aggregate in order to provide protection of this substrate and prevention of future corrosion. PermaClean 100 met those requirements and had additional benefits. It’s ceramic modification provided abrasion resistance, extremely low permeability and superior edge build/protection. The painting subcontractor, Genesis Environmental, especially liked that it applied very easily with their plural component spray equipment and they could backroll it to push it into the bug holes and other imperfections. 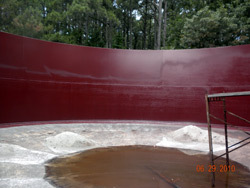 The Point Lookout Sludge Holding Tank was emptied and inspected in December, 2009 for Maryland Environmental Services. Pitting on the vertical shell interior was extensive and deep and the engineer was looking for a protective coating system that could rival the film build of trowel applied liners at a lower cost. After much discussion, he choose to specify PermaSafe 100 in multiple coats over a holding primer of PE70. Corrosion Control Corporation was awarded the contract and after blast cleaning the tank’s interior to a Near White (SP 10) specification, the holding primer was applied at 2 – 4 mils. Over the heavily pitted areas, a light coat (10 – 15 mils) of PermaSafe 100 was applied by spray and back-rolled into the pits. The balance of the 50 mils was then spray applied in a wet on wet application over the back rolled areas. A second coat was applied the next day. The total DFT for the interior system ranged from 100 to 120 mils. The tank’s exterior was spot and brush off blasted. Over the areas blasted to bare steel, a coat of Induron’s Induramastic 85 was applied by brush and roller to a minimum DFT of 4 mils. A full intermediate coat of Induron’s E-Bond 100 was applied to a maximum DFT of 2.0 mils. (This coat was chosen for its wetting ability which allows penetration into the roughened brush-blasted surfaces and “tie” those areas down. It is a translucent coating which allows its film thickness to be readily controlled by the opacity of its appearance). A finish coat of Induron’s Indurethane 6600 Plus was then applied at a DFT between 2 and 4 mils. PRODUCTS USED: Single coat of PermaSafe 100 @ 25 mils with a stripe coat of same product on weld seams, angles and joints. 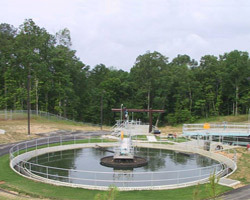 The Village Creek Peak-Flow Wastewater Treatment Facility in Birmingham, AL has a nominal treatment capacity of 60 MGD (peak 80 MGD) of final effluent-for discharge to Village Creek. During peak flow occurrences-such as those experienced during Hurricanes Ivan, Katrina and Rita-the plant can handle up to 360 MGD with the assistance of biological filters. Even larger incoming flows can be accommodated with the use of 20 surge basins, with a total capacity of 90 million gallons. In fact, the plant has experienced incoming flows of up to 425 MGD. Induron Coatings supplied the coatings on this project-including the epoxies, urethanes and acrylic products for the different substrates involved. As a note of interest, the Three Million Gallon Hydropillar plant water storage tank located at Village Creek-which is used to store treated effluent for washdown of plant components, and is coated with Induron epoxies & urethanes-was honored as the Steel Plate Fabricators Association’s “Elevated Tank of the Year” for 2003. Engineer: Gary L. Owen and Associates, Inc. The O.B. Curtis Water Treatment Plant-which treats surface water from the Ross Barnett Reservoir-is the largest water treatment facility in the state of Mississippi. 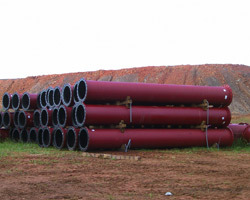 The expansion project (for the City of Jackson) effectively doubled the capacity of the plant to 50 MGD. The plant design included a new 25-mgd ultra-filtration membrane treatment plant, and a 5-million-gallon clearwell-which serves in parallel with the existing 25-mgd conventional water treatment plant. Renovations to the existing plant were also performed in concert with the plant expansion. The coatings Induron supplied on this project included epoxies, urethanes and acrylics. Induron Coatings also supplied the coatings for the facility’s original 1992 construction. The O.B. 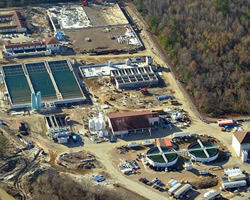 Curtis Water Treatment Plant Expansion was honored with “The Grand Conceptor Award” by the American Council of Engineering Companies/MS in 2008. Engineer: Neel-Schaffer Engineers and Planners, Inc. The Flat Creek Water Reclamation Facility has a capacity of 10.2 MGD, and serves more than 33,000 people. 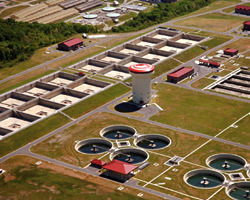 Utilizing unique and innovative techniques for optimizing the treatment process, the plant is consistently able to meet Georgia’s water quality goals for protecting one of metro Atlanta’s largest drinking water sources-Lake Sidney Lanier. The U.S. Environmental Protection Agency has honored the Flat Creek Water Facility with the “EPA Region 4 Clean Water Act Operations & Maintenance Award” in its Large Advanced Treatment Plant Category. Induron Coatings is proud to have supplied the coatings on this project-which included epoxies, urethanes and acrylics.